Thursday morning I was in my office and that question still haunted me. Last time around my world was totally turned upside down. This time it just seemed routine, normal. As I slowly made myself push papers and do the work before me my mind kept returning to the question. What was different? How can you be so peaceful in the face of this? I am familiar with the path forward. Sure, there will be surprises but for the most part I know what to expect from the process. Nancy walks well with me. I am confident I will not be alone. Last time I learned that life will be disrupted, not destroyed. I already know how to adjust and adapt my schedule to fit chemotherapy into life. Pacing myself is not easy but I know what works and I can take steps now to ensure success. This is now my “normal”. Last time this was a “new normal”. Reality is that this will be my normal for the remainder of my life. Chemo, breaks, constant monitoring, returns to treatment, repeat. First Baptist walked very well with me last time. I trust they will again this time. Nancy and I were not alone. Our community shared this journey with us. I had support from friends and family. Honestly I was surprised at where some of the strongest support came from. It was a blessing to see that people cared. In some way our lives had connected in a deep way and they were reaching out. It meant something to me. I met God in the midst of the turmoil and chaos last time. I am at peace because no matter what happens, numbers up or numbers down, I am confident I will do the same this time. My confidence is not in me, or in any spiritual practice I may have. My confidence is in Abba Father. Sitting in my office last Thursday my mind went to the many ways this journey has caused me to deepen and grow my faith. I would gladly give it up. I would not wish it upon anyone else. Yet, I am thankful for the way Abba Father has transformed the turmoil into a time to deepen and to grow me. This time has not been wasted. During worship we will sometimes sing a great song that helps me focus on offering praise to God no matter what the circumstances are. “Thou You Slay Me” causes me to remember that no matter what is going on in my life I can/should praise Abba Father. I can praise Him because those most difficult of times are being transformed into moments of growth and change in my life. Over the next few days my mind was drawn to two passages of scripture. Both passages talk of peace. They explain, or help me understand, how it can be that in the midst of returning active cancer I can be at peace. The first comes from John 14. 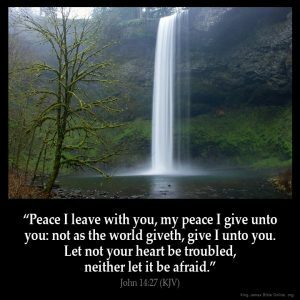 Do not let your hearts be troubled. You believe in God; believe also in me. 2 My Father’s house has many rooms; if that were not so, would I have told you that I am going there to prepare a place for you?3 And if I go and prepare a place for you, I will come back and take you to be with me that you also may be where I am. 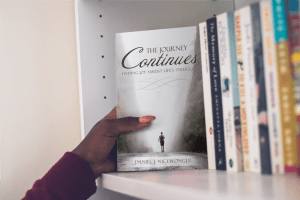 He shares the journey that is coming. Jesus teaches the he and God are one and the same. To truly know God you must embrace Christ. Jesus answered, “I am the way and the truth and the life. No one comes to the Father except through me. 7 If you really know me, you will know my Father as well. From now on, you do know him and have seen him. Jesus speaks of what life will look like as we walk with Jesus and the Father. We will be filled with power to do the very things we have seen (heard) of Jesus doing. Jesus promises the Holy Spirit to come infuse us with power to live and move like Jesus. In the midst of all of these words of encouragement and promise Jesus promises peace. I am at peace. It is a peace that “transcends all understanding”. A peace not from this world. I can walk into this next season with confidence knowing that whatever the future holds it will be well with my soul. I don’t think we ever counted on a love this severe. Perhaps I should say, I did not imagine a love this severe. And yet love was always defined by a Son and a cross. But I do see why people asked those in whom this love was made manifest to pray for them.